Ingleton is a village only just on the edge of the Yorkshire Dales National Park. It is situated on the western flank of Ingleborough surrounded by wonderful limestone countryside with mountains, caves and waterfalls. The village is famous for the Waterfalls Walk including Thornton Force and White Scar Caves which is now the largest show cave in the dales and one of the biggest in the country. In nearby Kingsdale there is a former Victorian show cave called Yordas Cave. The limestone hills around Ingleton contain some of the most extensive and challenging potholing in the country. With many miles of subterranean caves to explore, of which many of these systems are difficult and dangerous, they should only be attempted by experienced potholers. Climbing is another attraction along with many popular walks and rambles in and around the area so Ingleton is an excellent base not only for exploring the northern dales but also nearby Forest of Bowland, the Lake District and the Howgill Fells. Ingleton has a history going back to the iron ages when a fort once sat on the top of Ingleborough. The village houses a number of 16th century buildings and the remains of an agricultural past can be found in the village square. The old bullring where animals were baited and slaughtered is still visible in the tarmac. Ingleton’s commercial industry was in quarrying and coal mining and although quarrying still goes on the mining has now ceased. The only remnants being the housing area known as New Village built for the miners and their families. Ingleton can boast the first Hoffman kiln which is still visible in Mealbank Quarry and the site of a conservation park for the millennium. There were also many cotton mills powered by a watermill and signs of the mill races can still be found near the playground by the river. Ingleborough is the second highest of the Three Peaks and also the second highest in the Yorkshire Dales. It is the third and last peak to be climbed on the Three Peak Challenge walk. Ingleborough’s distinctive and striking appearance from all directions and from a great distance is due to the unusual geology of the underlying rock. The summit is a broad plateau half a mile in circumference carpeted with dry turf. At the highest point near the south western corner there is an Ordnance Survey trig point and just to the north is a well built wind shelter with a view indicator built into its centre. Between them there is a large cairn and where the Ingleton path reaches the summit rim there is an even larger cairn which is the remains of a battlemented round tower built in 1830. Along the northern and eastern edges of the plateau are the remains of a broken wall believed to have been a Roman military camp but now known to be an Iron Age hill fort or fortress. On the western side of Ingleborough there is a large limestone plateau known as White Scars below which runs the 4 mile White Scar Caves of which the entrance has been developed into a show cave. The ridge it throws out to the north east leads to the summit of Simon Fell. 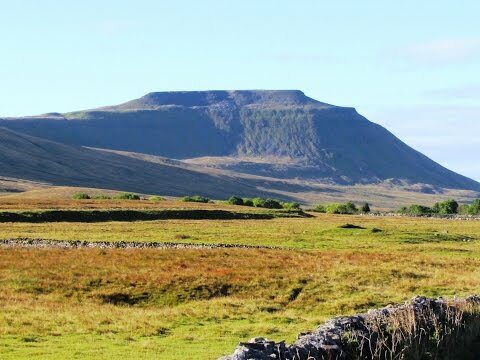 There are a few ways to ascend Ingleborough the most popular from Ingleton following a walled lane before emerging onto Carina Bottom then a steep climb through the limestone cliffs to the summit, there and back. It can be climbed from Horton-in-Ribblesdale over extensive areas of limestone pavement which is the route of descent of the Three Peaks Walk and has been greatly improved by the National Trust. There is also a much longer route from Clapham. Chapel-le-Dale is a hamlet situated on the B6255 road between Ingleton and Ribblehead. Chapel Beck which flows south westerly out of the village soon disappears underground at God’s Bridge and this is where the River Doe begins. Flowing in the same direction the river passes through Twisleton then drops many times forming Ingleton Waterfalls before reaching Ingleton where it meets the River Twiss to form the River Greta. We turn left out of the car park and head along the road. At the top of the road we turn right still following the road slightly uphill. We continue forward past the t-junction then at the end of the wall we turn right taking the track sign posted Ingleborough 2½ miles. We head forwards uphill following the track through the wall and continue between two walls. We go through a gate with two seats just on the left and keep heading forwards following the track past a farm on the left and then steadily start to head more steeply uphill until we reach the summit of Ingleborough. We pass between the shelter and the pile of rocks heading forwards on the level for a short way. Just past the big cairn we bear off left downhill on the narrow path along the edge. When the path splits we take the left path signposted Chapel-le-Dale to a wall corner. We go through the gate and soon start heading downhill very steeply to the valley bottom. We then follow the stone flags to go through a gate bearing right then left between the limestone pavements. The path turns right and we head forwards towards a gate. Just before the gate we bear off left slightly downhill to go through a gap in the wall. We head forwards to the corner then turn left downhill following the wall on our right to the buildings. We bear right at the buildings and follow the path through the fields to the main road and cross straight over to Chapel-le-Dale. We follow the minor road over a bridge and bear left to go through a gate next to a cattle grid. We are now on the Roman Road and we just keep following it until we see a barn on the left. We go through the gate at the side of the barn and head forwards to the River Doe. We cross over the river via the stepping stones (if flooded keep following the Roman Road to Ingleton) and bear right over the fields with a wall on our left. At the top right hand corner of the field we go through a gate and head towards the telegraph pole. We follow the telegraph poles until we come to a track. We turn left and go over the stile in the corner. We come out at a quarry and we bear left following the public footpath sign through the trees. At the road and quarry entrance we follow the public footpath sign through a gate, to avoid walking on the road, to the next gate. We turn left to the road and cross straight over. We now head uphill to the top of the field, cross over a ladder stile, turn right and follow the wall to the track we started on. We now retrace our steps back to the car park. This is a moderate to hard walk on good well distinct paths and tracks with some steep inclines and declines. Approx 9.9 miles allow 4.5 to 5 hours using OS Explorer Map OL2, Yorkshire Dales, Southern and Western areas. Start point: Ingleton car park with Tourist Information Centre. From the A1 take the A684 to Bedale, Leyburn and Hawes. Make your way through the centre of Hawes and when the main road bears right to Sedbergh take the left turn to Ingleton on the B6255. On entering Ingleton follow the road round to the left onto Main Street. The car park at the Community Centre with a Tourist Information Centre is situated on the right. From the A65 take the B6255 into Ingleton heading straight over at the roundabout. The car park at the Community Centre is on the left. Parking: There are two Pay and Display car parks in Ingleton. The main one is at the Community Centre on Main Street, the other on Backgate just off the B6255. Both are £3.60 for over four hours. There are public toilets in the Community Centre car park and also at the Ingleton Waterfalls car park. For refreshments in Ingleton there is the Coffee Pot, a small family run bakery and three pubs the Wheatsheaf Hotel, the Craven Heiffer Inn and the Three Horseshoes all three have B&B accommodation.